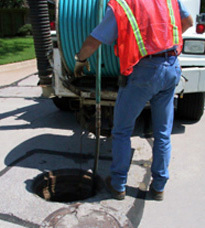 Whether you’ve got a slow moving drain or a backed up sewer line, we’re here to help. Specializing in emergency service, our licensed and insured drain cleaning technicians have the tools, technology and knowhow to fix your drain and sewer line problems quickly and efficiently. Save yourself the time, hassle and money by calling our plumbing experts from the start. Our motorized rooters, high-velocity water-jets and video inspection, can diagnose your problem correctly and quickly. Call us today for all your drain cleaning, sewer line, plumbing and rooter needs.